Struggling to build muscle? 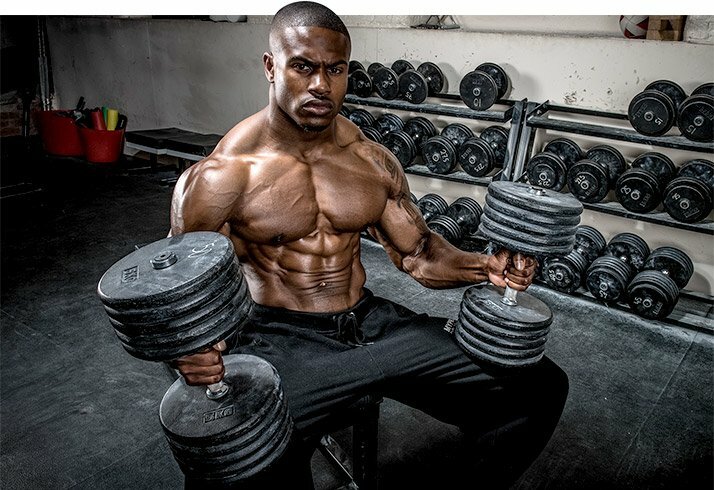 Follow ripped bodybuilder Simeon Panda's 6 principles of growth to build the body you desire! Experienced lifters talk about "beginner's gains" in reverent terms. However, more often than not, beginning lifters are simply too fickle and impatient to experience these gains. They'll start a workout program, but their initial gung-ho spirit fades faster than a Snapchat. Soon, they're either adding in heaps of new exercises to an already flawed routine, or they've checked out altogether, disappointed by a lack of instant results. "Once you've started a specific training program, you need to stick with it for a significant amount of time to see its benefits," Panda instructs. "People tend to add things they've read about or otherwise change [programs] up, but at the start, you need to focus on the basics before adding anything more complicated." "Once you've started a specific training program, you need to stick with it for a significant amount of time to see its benefits." Like many enthusiastic young men, Panda initially worked every muscle every day. Once he got more systematic, everything came together. "I did single body parts and trained almost every day," says Panda. That means tackling each major body part on its own day during every seven-day stretch for up to an hour: back, chest, legs, shoulders and arms, with abs tacked on at least twice a week, doing multiple exercises for 3-5 sets apiece. There is a caveat to this advice, however. "The decision depends on the time frame you have available," he says. "If you have the time to dedicate to five workouts per week, then this one-body-part-per-workout approach is good. But, if your schedule doesn't allow it, you may have to do an upper/lower split, and that's OK."
More crucial than the nature of your split, he insists, is that you find a dedicated time to fit it into your schedule. "I go at 5 in the evening every day," Panda says. "It's from my former 9-to-5 days. I always used to get out of work and go train, so I'm still in that habit now." Post-Workout Powder. Contains 5 G Per Serving. Go Now! Both sides have valid points. The real question is: Why are we taking sides at all? "Both machines and free weights have their place in a beginner's program," Panda explains. "You shouldn't be afraid of hard exercises, though. For example, I would say you should be doing squats and deadlifts right from the start, as long as you get the guidance needed to perform them correctly and avoid injury." "You can spend a similar amount of time in the gym as a more advanced bodybuilder would—60 minutes, even 90 for legs—but you don't need advanced techniques like supersets, dropsets, partials and others," Panda says. "Add those in as you get to the intermediate level. It can be something as simple as adding a dropset at the end of every exercise, or supersetting two of your exercises on each body part. Just little tweaks." Panda has similar advice about training to failure: "The same thing goes for taking sets to (momentary) muscle failure," he says. "You don't need that early on to make gains, although I do recommend pyramiding up the weight from set to set." Those who don't make gains on a bodybuilding program tend to blame their training first. Then they'll fire up the search engine and start on a quest for the "perfect exercise" or "perfect routine," or just start adding intensity techniques out of fear that they're not going at it hard enough. Unfortunately, the first two items on that list don't exist. With the third, you could be onto something, but more likely, you're falling short outside the gym, not in it. "You need to take diet as seriously as you do your workouts," Panda says. For faster, more measurable results, you should track your food and macronutrient intake, which will tell you if you're falling short on your nutritional needs. Yes, that means write it down! Keep a food log, or utilize a fitness app. Look for the Myprotein app, available later this year, to track your entire regime. Panda is a big believer in building a nutritional approach around some foolproof staple foods. For instance, he eats a lot of fish like salmon, tuna, and mackerel, all of which offer ample protein. Not that he's against chicken or steak. "Fish is just easier to prepare," he explains. As for carbs, load up first with vegetables like broccoli, spinach, asparagus, sweet potatoes, carrots, and salads. Then, fill the rest of the hole in your stomach with whole grains. "Whole-grain rice is one of my main sources of carbs," Panda says. Want to compete? Don't go it alone. "Before your first competition, you should watch video religiously of some of your favorite bodybuilders posing," he says. "You may have a great physique, but if you don't know how to present it right, you won't do well in front of the judges." Equally crucial, he says, is to seek out others who have competed before. "Ask people who know the ins and outs of the sport to check out your physique to critique your strengths and weaknesses and watch your posing routine," Panda says. "Find a team you can trust." 82% Protein Content Per Scoop, Suitable For All Individuals. Go Now!